There’s never a better time to plan for your seasonal hiring than right now. Hiring multiple employees at once can be hectic and intimidating. So having a plan in place for each task, deadline, and who does which task is key to keep up with everything. Planning ahead will help keep you on track with essential tasks, and help you have a successful hiring season. How many people will be hired? Who the hiring managers are. Is there a budget in place for advertising? What are the potential start date(s) for new hires? Meet with hiring managers to review requirements for positions. Gather job descriptions, proofread and review them for search engine optimization. Plan where you will advertise the jobs (Indeed, Monster, ZipRecruiter, Craigslist etc). Do you have an advertising budget to boost your job posts if free postings don’t bring in enough candidates? Set potential start dates if not already in mind. Get hiring managers to schedule blocks of time in advance for interviews. 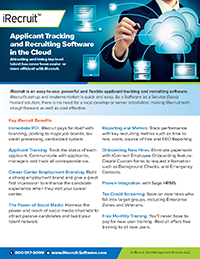 Get hiring managers trained on what to expect in the applicant tracking software. Post Job advertisements to your website and any other source you typically post to. Blog, and post that you are hiring to spread the word to social media sites. Send an email blast to previous seasonal hires to let them know you’re hiring again. Screen initial candidates and start scheduling interviews. Contact candidates to schedule interviews. Repost jobs if you did not receive enough candidates in the first wave. Conduct interviews and determine if you will make an offer. Get all background checks and drug testing completed. Send rejection notices to candidates not hired. Make sure all needed equipment is ready, uniforms ordered etc, workstations available for new hires. One-Two days Before Start Date (or Start Date if you do a group class for onboarding). Get all onboarding documents done. Make sure all new hires know where they are going and who they will meet on their first day. This entry was posted in Blog, iRecruit Blog and tagged applicant tracking software, iRecruit, onboarding, planning, seasonal hiring. Bookmark the permalink.